It's just about the end of January, and several teams are starting to feel the effects and rigours of an NBA season. The main culprits are fatigue and injuries. Every team in the NBA is up against it, and depth is now just as important as the five guys that start every night. Look at the Cleveland Cavaliers and Toronto Raptors for example. The Cavs have lost three straight and six of their last 10 games. They have been absolutely brutal on the defensive end of the court, giving up more than 100 points in 11 straight games. That is unheard of when talking about the reigning World Champions. LeBron James is complaining about not having enough playmakers, and the world is waiting to see what the organization does and who they trade for to appease the King. Fortunately for the Cavs, they play in the terrible Eastern Conference, where the second-place Raptors have lost five straight. The Raps have been battling an injury bug of their own, with Patrick Patterson and DeMarre Carroll both missing time due to injury. Now they must play without their all star shooting guard, DeMar DeRozan, who is listed as day-to-day with an ankle sprain. This brings me to the Utah Jazz. The Jazz are also feeling the effects of the mid-winter blues and have struggled mightily over the last couple games. Coach Quin Snyder is chalking it up to fatigue and is on record of saying ""Everybody's fatigued. You're not fatigued when you're not fouling people. You're not disciplined. We started making some undisciplined plays and we had breakdowns where we put them on the foul line. All of a sudden, we were playing against a set defense every possession. We were stuck in mud at that point" After tonight's game, the Jazz will get a day off before facing Memphis and then they will play just twice in a seven-day span. Rest is on the way, and the Jazz will need to take advantage of it if they want to move up the standings into a Top 4 spot. Unfortunately, the last Jazz pick missed by half a point. They beat Dallas 112-107 but were laying 5.5. Time to get it back and then some. The Jazz are currently 12.5-point favorites against a Lakers team playing in the second game of a back-to-back. This is Jazz's first game of a four-game homestand. As a reminder, I will release picks throughout the season using Doc's Sports Unit Betting System and will keep track of the results, regularly checking in with observations about what we can learn or have learned up to date. The Jazz come into tonight's game on the heels of a terrible loss to the Denver Nuggets. After taking a four-point lead into the second quarter, the Jazz found themselves trailing by 12 heading into halftime. They never recovered. 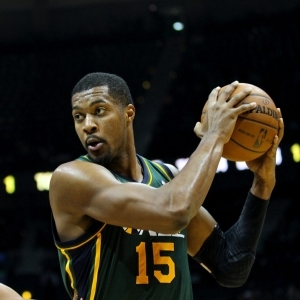 Derrick Favors led the way offensively for the Jazz with 18 points, while George Hill and Boris Diaw pitched in with 17 and 16 points, respectively. It was a tough night for the duo of Gordon Hayward and Rudy Gobert, who combined to score just 20 points - a far cry from their season averages. In the prior game, the Jazz suffered a heartbreaking loss courtesy of Russell Westbrook and the OKC Thunder. Westbrook hit a pull-up jumper with 1.4 seconds left in regulation to secure a 97-95 victory and snap the Jazz's six-game win streak. In that game, Hayward led the way with 17 points, and Favors picked up a 10/10 double-double. The Jazz's undoing was the fact that they shot 5-for-21 from three-point range (24 percent) and made just 18-of-26 free throws (69 percent). The Thunder didn't do anything special; the Jazz ultimately beat themselves. The Jazz currently sit 29th in the league in offensive pace (93.5) and 27th in points per game (99.6). They will need to figure out a way to right the ship and get back in the win column against an inferior Lakers' squad that has very little to play for. The Lakers come into this game losers of two straight after getting torched on the defensive end of the court in both games. Last night, they gave up 105 points to the Portland Trailblazers and allowed them to shoot 48 percent from the field. The previous game was even worse. They gave up 122 to the Dallas Mavericks of all teams. The Mavs shot 49 percent from the field, including 17-of-39 from three (44 percent) and knocked down all 19 of their free throw attempts. Its tough to win games in The Association when you give up numbers like those on a consistent basis. Lou Williams has been the man of late for the Lakers, leading the team in scoring over the course of the last two contests. He put up 15 against the Mavs and 31 last night against the Blazers. The Lakers conclude their three-game road trip tonight before going home for one game and then back on the road starting Feb. 2 for five games. The Jazz are 3-8 ATS in their last 11 Thursday games and an even worse 1-5 in their last six games overall. The "under" is 6-1 in the last seven games against the Pacific Division and 17-7 in the last 24 games overall. The Lakers are just as bad against the spread. They are just 2-6 ATS in their last eight games overall and 5-17 ATS their last 22 games against the Western Conference. The "under" has also been a solid bet for the Lakers, going 5-1 to the "under" in the last six games. Last article, I wrote about "must-win" games, and the Jazz were able to take care of business against a poor Mavericks team. This is a similar game, but more importantly this game should give the Jazz a chance to fix what's wrong with them and boost their confidence levels heading into February. The Lakers are not a very good team. Their five starters scored a combined 27 points in yesterday's loss to the Blazers. How can any team expect to stay in games when you get that kind of poor contributions from your so-called "best players"? I am very skeptical right now of laying double digits with the Jazz, but I do think they will cover the spread. Instead, I will be looking to play the "under", which currently sits at 201.5. The Jazz have the best defensive numbers in the league, and I have a hard time imagining the Lakers breaking them down and putting up a bunch of points.